The development of large and interconnected data sets has awakened educators to the value of strategically using data to inform education policy and improve instruction. Recognizing that using data effectively is critical to improving student achievement, numerous organizations and agencies, including the Bill & Melinda Gates Foundation, are supporting school districts and other education agencies in building their capacity to generate and use data. Even with essential data systems and supports in place, districts face challenges related to the strategic use of data. Many districts do not know what questions to ask, what data to use, or how to interpret findings to improve policy and practice. 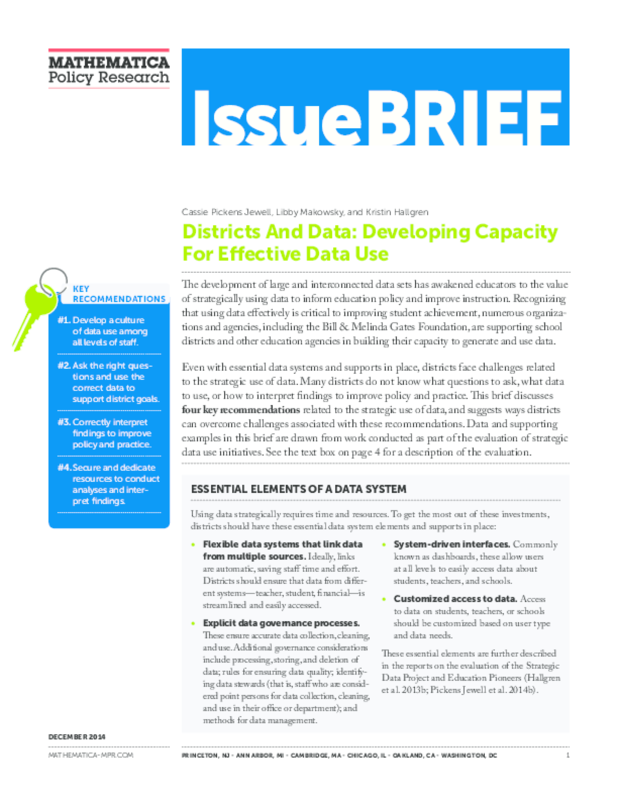 This brief discusses four key recommendations related to the strategic use of data and suggests ways districts can overcome challenges associated with these recommendations. Data and supporting examples in this brief are drawn from work conducted as part of the evaluation of strategic data use initiatives. Copyright 2014 Mathematica Policy Research, Inc.. Copyright holder(s) Mathematica Policy Research, Inc.